Dr Alex McMinn is the owner and clinic director of Potomac Family & Sports Chiropractic. He has been practicing as a Sports Chiropractor for the last 20 years. Dr. Matt graduated from New York Chiropractic College in 2011. Since graduating he continues to further his knowledge of the Neuro-Musculo-Skeletal system so he can implement an innovative approach with each treatment. Robert has been practicing Massage Therapy since 2011. In that time, he has managed to acquire a very impressive resume. In addition to now being here with us at Potornac Family Sports and Chiropractic, he currently treats the Georgetown University track team. Dr. Matt is a fantastic chiropractor and sports injury therapist. 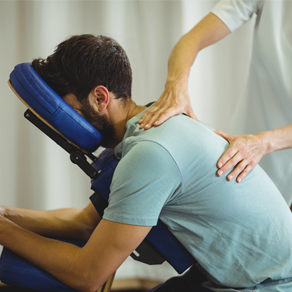 I came in with a several issues related to my left shoulder and right hip, and he guided me through a series of treatments and exercises that lessened my symptoms immediately while providing a path to improving my overall mobility long-term. I've been to several rehab specialists, and the difference with Dr. Matt is that he really takes the time to listen to what's going on and come up with a tailored program focused on long-term, whole body improvements. I can't recommend him enough. I started going to Dr. Alex about 2 years ago. I hurt my back shoveling snow and needed a chiropractor. I told Dr. Alex what was wrong, and he knew exactly how to fix it. He helped my back so much, I continued to go to him throughout my junior and senior baseball season. I plan on seeing him every time I come home from school. Chiropractic care is a wonderful thing to do for your health and well-being, not just as a treatment after an injury. It is great preventative medicine and Dr. Karen is a magician! My whole family has been going to her for years and years!